How do you top ice cream? I could eat ice cream every day, I don’t, but I could! To be honest, when I’m on summer vacation on the East Coast, I do eat it every day. I consider it a food group unto itself. Toppings make it even better. Home made magic shell –what’s that you ask? How do you make it at home? It’s so easy and much better than the store bought. Try this recipe and let me know what you think of it. Thanks to alphamom.com for the photo. Posted in Caramel, Ice Cream, Marshmallow, Milk chocolate, Peanut Butter, references, recipes and tagged dessert. Bookmark the permalink. Mmmm… looks v nice. It looks almost like the häagen dazs chocolate topping. Thank you, that makes my week! Really, you have saved my fall, winter and spring, for now with your amazing Magic Shell recipe my beloved Dippy Cone season, which seemed only to extend during the summer soft serve season, can last all year. 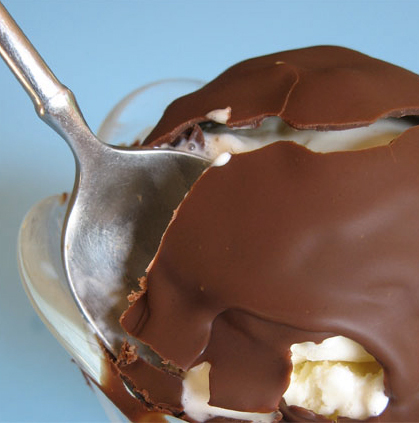 I mean what could be better than homemade chocolate shell all 12 months of the year? Now it is time to stock up on ice cream, semi-sweet chocolate morsels, and coconut oil (which has many health benefits!) Love it! Just made some of this for my upstairs neighbor’s birthday! Thank you for the recipe!